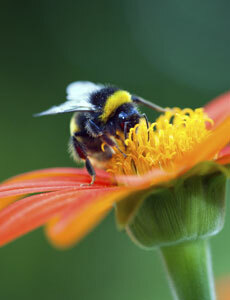 The number of bees in the UK is declining at an alarming rate, yet there are few explanations. It's suggested that the decline in native and wild flower rich grassland could be a cause. To help save the bees, we have put together a list of bee friendly varieties for you to grow, to encourage and feed the bees in and around your garden. If you wanted to choose just one or two varieties to grow to help the bees, we suggest any variety of Scabiosa or a wild flower would be ideal wildlife-friendly plants. Click here for more inspiration on bee-friendly plants. Hedgehogs are on the decline, according to a new report, but there are plenty of things you can do to encourage them into your garden. Hedgehogs will travel approximately one mile each night to forage for food, find shelter or search for a mate. To roam freely they need open gardens, but if yours is enclosed and you can create a gap (15cm will do) in a fence or dig a channel under it, this will help them a great deal. Food supplies can run low in cold or very dry weather and hedgehogs are very fond of meaty dog food, mealworms, sunflower hearts and unsalted peanuts. You can also buy ready-made hedgehog food. Leave out some water (if you already do this for the birds, the hedgehogs will drink it too), but please don't give them milk. 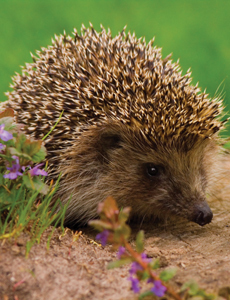 Gardening organically helps too - slug pellets are harmful to hedgehogs, so if you can use natural deterrents such as beer traps or broken eggshells, this will help to boost hedgehog survival rates. And, last of all, if you spot an injured or sick hedgehog, contact the British Hedgehog Preservation Society on 01584 890801. 3. Flowers for colour - and more. It may seem obvious but don't forget to include plenty of colourful flowers to attract and feed butterflies and other insects as well as bees. Almost all flowers will do (that is what they are for, after all) but some are particularly suitable. We also offer a range of wildflowers which are ideal for wildlife. You may not think lawns can offer much for wildlife , but in fact they are home to a host of insects which in turn provide food for birds and other animals. By avoiding the use of chemicals, leaving the grass a lttle longer (around 3 - 5cm) and mowing less often (say, every two weeks but certainly no more than weekly) you will encourage these harmless insects to thrive. Leaving the grass longer during winter and not mowing again until march will provide shelter and hibernation sites for many insects. If you can leave an area of longer grass - 20-30 cm - that is even better as it will provide shelter for grasshoppers, lacewings and many other creatures, as well as producing seed as food for birds. Alternatively plant taller ornamental grasses in the border, which can have the same effect. Leave a pile of dead wood in a shady spot and this will serve as a shelter for beetles and other insects. Birds are among the most welcome garden visitors, so encourage them to stay by providing food and nesting sites such as boxes (out of reach of cats!). Even a small pond can be a little oasis for wildlife, attracting beautiful dragonflies, offering water for birds and small animals,and providing habitats for frogs, newts and many aquatic insects. Be more patient with pests! Try to avoid the use of chemicals to control pests. - instead, encourage their natural predators with plants which will attract them, for example chamomile, marigolds and hyssop. 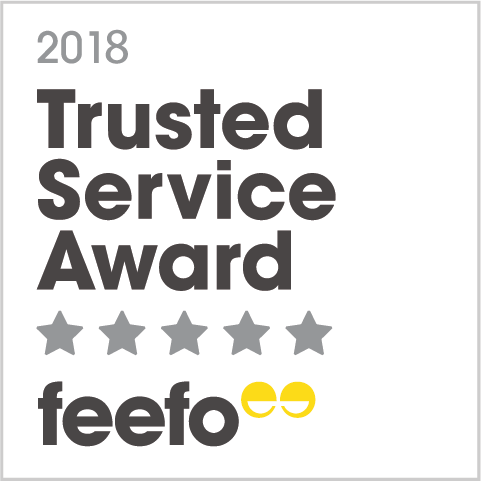 If you need to tackle a particular problem pest, try our range of natural pest controls. Growing green manure over winter helps maintain nutrients in the soil and provides competition for weeds, minimising the need for weedkillers and reducing the need for additional fertilisers. Borage, chives, comfrey, fennel, hyssop, lavender, lemon balm, lovage, mint, rosemary and thyme all encourage beneficial insects as well as producing delicious ingredients for the kitchen. Take a look at our herb range. 12. Lastly and least effort of all - do nothing! 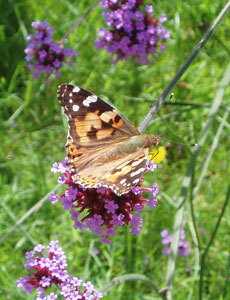 Leave a corner of the garden undisturbed and it will naturally become a haven for wildlife - what could be easier? If there are a few logs and old pots for shelter so much the better.